As usual, any issue just tell me, hope you like the mod. I'm open to suggestions and I read all comments. Check my images for W.I.P shots and such about incoming mods. Not necessarily related in any way whatsoever, crashes have multiple reasons, it's often nowhere near as a simple as a single mod being the cause, definitely not always the last installed mod. Specially since you have said "after 20 mins" and not "as soon as the lockpicking interface opened the first time". This mod does zero outside that context. There's nothing to update on, this report is most likely improperly attributed. Crashes my Skyrim at the start of loading any savegame. Ran it through nif optimizer, filesize was smaller afterwards, still happened. Never happened in Oldrim, strange. Strange indeed, I assume by comments and endorsements this isn't happening to everyone. And i'm pretty sure I tested this. I don't know how it would crash to you but not everyone with just the mesh being replaced. That's generally either it crashes for everyone if there is something wrong with it or it doesn't crash. This looks absolutely incredible! It has breathed new life into lock picking for me. I have actually uninstalled my lockpick helper cheat so I can appreciate this mod properly lol. Thanks a lot for your work. 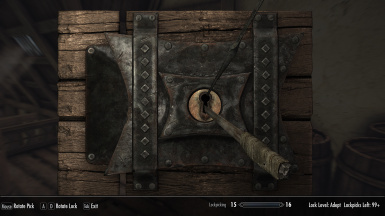 anyone else having an issue where you cant rotate the lock pick? its stuck all the way to the right. Hi, and thank you for your work. Thanks for the new model and textures they look really good, as someone who actually enjoys picking locks this was a refreshing change. No. Thats a retexture, this is a different model. 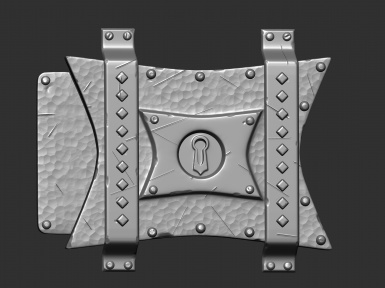 In my opinion this model has enough reference points that you dont really need lockpick graduation. Seems cool from the gallery. I will track this mod for now. Good work anyway. Just handed this my endorsement. Worked well for Oldrim & works even better for SSE. Thanks for sharing.